The Mercure Reims Cathedral is a modern 4* hotel in an ideal location for those looking to explore Reims. The Mercure Reims also comes highly recommended for corporate clients, with its range of meeting rooms and large accommodating restaurant. 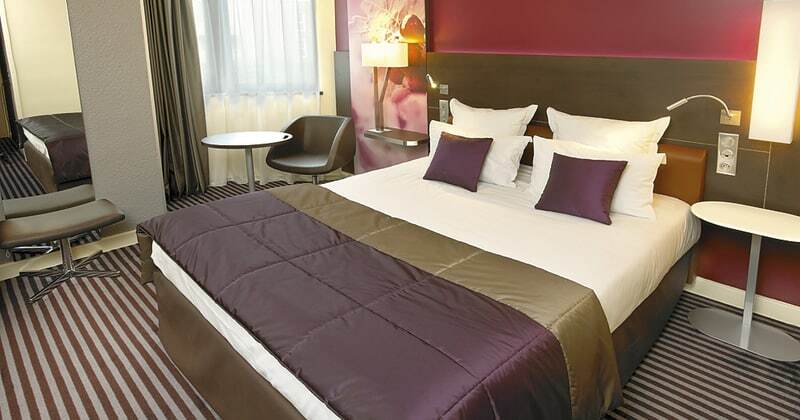 Mercure Reims Cathedral is located ideally, just a 5 minute walk to the centre of Reims. Conveniently close to the A4 motorway, the TGV station and within the popular tourist area of Reims, there is access to many of Reims’ celebrated bars and restaurants. The guests in the 126 rooms within Mercure Reims are well served. There is a spacious reception and a modern, well furnished restaurant serving French cuisine. Dukes the bar stocks a wide range of good Champagne and is open late in the evenings. For corporate clients Mercure Reims has an excellent range of meeting rooms suitable for anything from 15 – 180 people. Guests staying at the Mercure Reims Cathedral can expect spacious rooms with elegant decor and furnishings all with en suite facilities.